On the last night before Jeff and Artis left to go to the Coventry job, they called me down into the studio (I think we can call it that, now – doesn’t seem right to use the term ‘garage’ any more). They’d got me a little gift, they said. 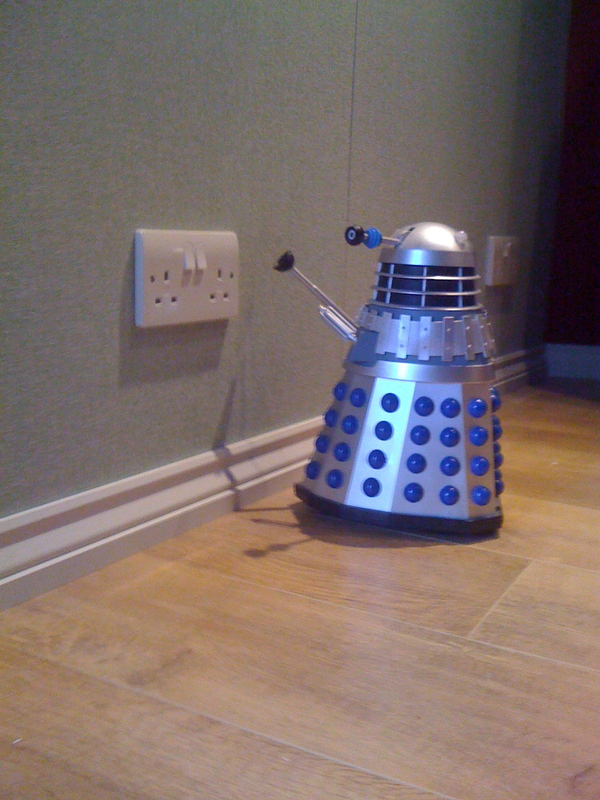 And it was – a remote controlled Dalek. I’ve been a bit of a Whovian for some years now (since about 1975, although now I’m a parent I’ve got more of an excuse) and the guys had noticed the DVDs and other such fandomery around the house. Dr Who fan + laminate floor = Dalek invasion opportunity! Thing is, they got me the silver one with the blue spots. Which, as I’m sure you know, operates at a radio control frequency of 27MHz. And there’s only one thing more embarrassing than being overjoyed to take receipt of a 27MHz Dalek. And that’s being overjoyed to take receipt of a 27MHz Dalek when you already own exactly the same model. Now, I’m no expert on radio transmission, but… I wondered what would happen if we used two Daleks and only one controller. With a Genelec 8040A playing the role of the Mechanoids.